The exhortation to “Go West!” has always sparked the American imagination. 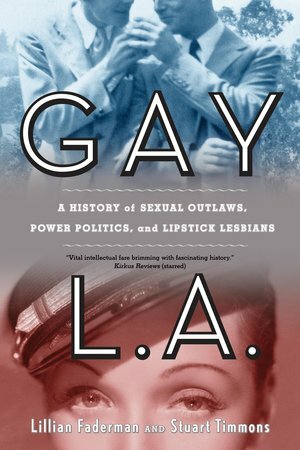 But for gays, lesbians, and transgendered people, the City of Angels provided a special home and gave rise to one of the most influential gay cultures in the world. Drawing on rare archives and photographs as well as more than three hundred interviews, Lillian Faderman and Stuart Timmons chart L.A.'s unique gay history, from the first missionary encounters with Native American cross-gendered “two spirits” to cross-dressing frontier women in search of their fortunes; from the bohemian freedom of early Hollywood to the explosion of gay life during World War II to the underground radicalism set off by the 1950s blacklist; and from the 1960s gay liberation movement to the creation of gay marketing in the 1990s. Lillian Faderman is the award-winning author of numerous books on lesbian/gay history, including Surpassing the Love of Men and Odd Girls and Twilight Lovers, which were both named New York Times Notable Books of the Year. Her most recent book, Naked in the Promised Land, received a Judy Grahn Award for nonfiction and a Lambda Literary Award for memoir. Stuart Timmons is the author of The Trouble with Harry Hay, which was a Book of the Month Club selection.